Since 2011, Your Overseas Wedding has officially become a member of “Quality Wedding Merchant Scheme”. Our service, process, quality, employee performance, and after sales performance are approved by Hong Kong Productivity Council through an independent assessment and won the recognition of ESDlife. 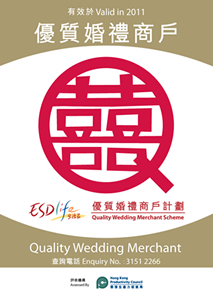 Hong Kong Productivity Council is the dedicated independent assessment organization of the “Quality Wedding Merchant Scheme”. The independent assessed areas include: service, process, quality, employee performance, after sales service, shop image, business environment, customer point of view, selectivity, operation system, employee, quality control, order and receipt information, emergency preparedness, service skill, product and service knowledge, grooming and appearance etc. Many nuptial couples feel frustrated when choosing a wedding merchant. They worry that the service provided by the wedding merchant they have chosen may not satisfy their needs or even closed down at any time. “Quality Wedding Merchant Scheme” can assist nuptial to select the most confident assurance merchant in a various choices of wedding merchants in the market. Your Overseas Wedding is now one of the members in the scheme which proves the quality assurance of the services provided by Your Overseas Wedding. The company has dedicated to provide the best service in order to help nuptial couples organize a perfect wedding or capture the most romantic pre-wedding photos. Regardless of Australia, Japan, Korea, Thailand, Bali, Hawaii, Prague, Hong Kong or Macau, nuptial couples can enjoy the quality assurance wedding and photo shooting services from Your Overseas Wedding.